'He Named Me Malala' review: Your teenager must see this. The movie you must take your teenager to see. In this land of middle class woe I know I’m not the only mother who worries that my kids are spoilt brats who take their luck, education and wealth for granted. Teenage girls may spend hours watching puckered up popular pouts on Instagram but right now they can find a hero on the big screen. Her name is Malala Yousafzai and she will rock their world. So before you go to the final of the Hunger Games Series, before you drag her to that old fashioned retro reactivated Star Wars, drag her off to a new documentary named ‘He Named Me Malala’. 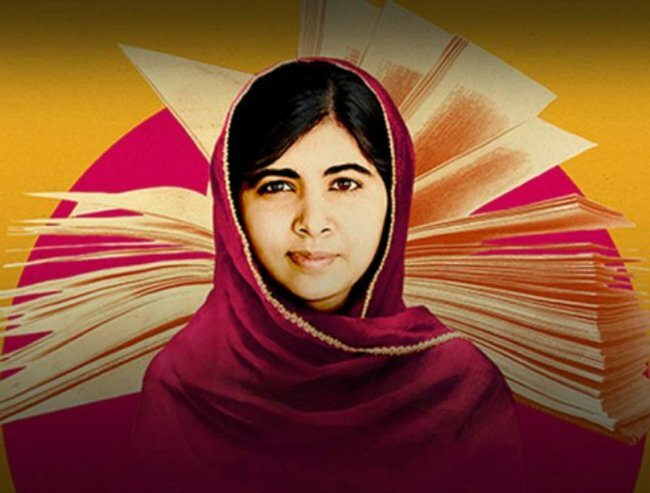 Watch the trailer for ‘He Named Me Malala’ below. Post continues after video. The film tells story of this incredible young girl’s dangerous life fighting for her and others right to education. It tells of her bravery, her beauty, her capacity for compassion and love, for rousing speeches and for moving mountains. Growing up in Pakistan her world and struggles may be as far away from our teenagers’ lives as you can imagine. Yet Malala still has annoying younger brothers she slaps, worries about her school grades and stresses about whether other girls like her. And, despite having a bullet damage her brain and having to speak another language, the only time she becomes inarticulate is when she’s asked about a boy. Because, after all, this warrior woman is still a teenager (albeit one who has a Nobel Peace Prize, received several standing ovations at the UN and who has to interrupt her exams to meet Bono). That’s what your teenager will see while you are choking on your popcorn. But for a mother this film is not about Malala. It’s a story about parenthood. Malala with her father. Image: Youtube. Malala&apos;s father Ziauddin named her after a legendary Afghan teenager who led an army to victory. A girl who died on the battle field while urging her men it was &apos;better to live like a lion for one day than a slave for 100 years.&apos; Quite a legacy to lay on a baby. The film focuses a parent&apos;s mind on a huge and confronting question. When a parent&apos;s role is to protect their child, to keep them away from harm, to keep them alive, what is the cost of bringing up a lioness who wants to take on the world? Ziauddin Yousafzai lit the candle of of knowledge within his daughter. He gave her that name. He asked her if she would like to write for the BBC about living under Taliban extremism in the Swat Valley in north-west Pakistan. A former teacher, school Principal and Diplomat, he is a wonderful, humble, shy, supreme man but he and the film confront the question could we let our own daughter stand up for equality when it could lead to her slaughter? I&apos;m not sure I could. Her beautiful father is the strongest man I&apos;ve seen but you will shake with sobs when you witness his pain about the violence against his daughter. But you do get an answer from this film. Malala says "my father gave me the name Mahala, but I made me, I chose this life and now I must continue it". And she does. This is a film you will see together but see differently. It is a film about parenting, destiny, bravery, sacrifice, purpose, education, enlightenment, love, devotion, power and wonder. At best, Malala will become your teenager&apos;s new hero. She will inspire her to help Malala&apos;s organisation educate Syrian refugees, help girls kidnapped by Boko Haram in Nigeria and speak out for 66 million girls deprived of education around the world. At worst, your daughter will sit up and check her privilege and not winge about school for at least a week. My sister took her two daughters and they thought it was incredible. The 15 year old (the same age as Malala when she was shot) texted me "It was really moving to see her responses and how she handles everything like how she has no anger towards the Taliban and shes not afraid and now she makes the most of everything and is truely appreciative. It really made me grateful for everything I have and the relationship with my parents I have." Malala and her brother. Image: Youtube. Oh Yeah. Who needs commas when you get that reaction from a young girl. I will be dragging my daughter on the first day of her school holidays.